Recent studies show that many classrooms and school halls have poor acoustics. As a result, children with normal hearing are often unable to make out what is being said in class. While adults will guess at missing words, children find it much harder to fill in the gaps and their educational development can suffer. Children with hearing impairment suffer even more and legislation is now in place for schools for cater for such children. All school buildings are now subject to detailed design checks and on site inspections by Building Control Officers. Section 1 of the Building Bulletin 93 describes the “Specification of acoustic performance” . This section gives the performance targets for compliance with the Requirements from Part E of the Building Regulations. Provide a regulatory framework for the acoustic design of schools in support of the Building Regulations. Give supporting advice and recommendations for planning and design of schools. Provide a comprehensive guide for Architects , Building Control Officers, Building Services engineers, schools, clients and others involved in the design of new school buildings. Unfortunately , large numbers of classrooms and halls in the U.K currently suffer from poor acoustics. Poor acoustic conditions in the classroom increase the strain on teacher’s voices as most teachers find in difficult to cope with the high noise levels. This often leads to throat problems due to prolonged use of the voice and the need to speak very loudly to be heard. Recent surveys in the U.K and elsewhere show that teachers form a disproportionate percentage of throat clinic patients. Historically , there have been a number of factors preventing good acoustic design and BB93 addresses these issues. Pressure on finances had meant that, in the past, acoustics came low in the list of design priorities. 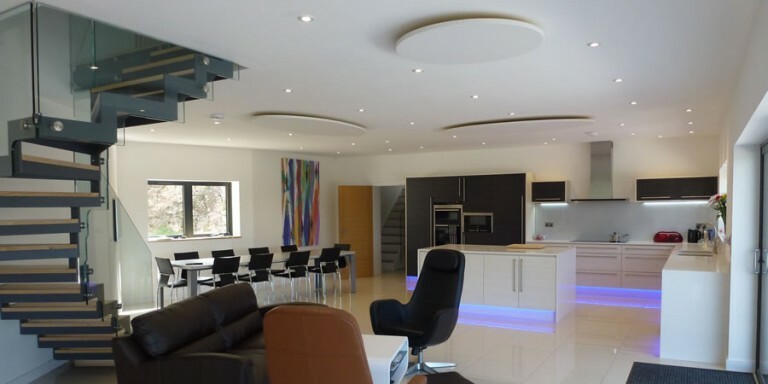 However, the acoustic requirements have a high priority as it is subject to Building Control Regulations. Many classrooms and halls have hard floor, wall and ceiling surfaces. Although these look nice and clinical , the hard surfaces bounce noise around the room without dying away. This leads to an amplification of the noise and make sound difficult to hear. This places a strain on the teachers as well as the children as the result is a “din” as opposed to sound being clear and intelligible. Irrespective of the construction of the room, the rooms must be “fit for purpose” for teaching . Soundsorba’ s qualified and experienced acoustic engineers can advise on the best form of acoustic treatment to various rooms and halls. As Soundsorba provide this service is free of charge, it will be wise to speak to one of our acoustic engineers at an early stage if your school project may have issues with acoustics. These are very popular in school classrooms , music rooms and corridors as they can be glue bonded to the existing ceilings without any major changes of existing surfaces. Therefore lights , etc. do not need to move as the panels are simply cut around the light fittings. Also being a D.I.Y product , many schools have in house maintenance team who can easily fit these themselves , which saves costs. Being only 30mm thick and lightweight , they do not reduce headroom height. An added bonus is that they are pre decorated in a white colour hence no additional decoration is required. Cloudsorba are acoustic panels which are suspended from the ceiling at chosen suspension depth to absorb reverberant noise. These a particularly useful when there are services fixing do the existing ceilings such as pipes, conduits etc. These have the unique appearance of “Clouds” hanging from the ceiling. These are available in a very wide range of colours and can be colour co-ordinated to suit the classroom, dining hall or main assembly hall. The panels are manufactured to suit the sizes required to suit the room or hall. Installation is simple as they are suspended on very thin steel wires. An added advantage is that they can be “unhooked” to get access to services above and hooked” back very easily. Wallsorba acoustic panels are extensively used in schools where it is practical to apply acoustic panelling onto walls. These are available in very wide range of standard colours and sizes. Wall to ceiling lining versions are provided as well as bespoke sizes to suit wall dimensions. Different shapes such as circles, triangles , etc. are also manufactured to fit into the design scheme. These are a widely used solution in sport halls where a degree of impact resistance is required from footballs, basketballs, shuttlecocks, etc. Two stock colours are available in white and beige. However any RAL colour is available depending on minimum quantity. This product is used on high level walls and ceilings in sports halls, classrooms, corridors and music rooms. These are used on ceilings and walls where an extremely strong and durable product is required which has great impact resistance as well as the beauty of wood veneer surface finishes. It gives a high class finish whilst providing excellent sound absorption . Slatted face patterns are available as well are circular hole face patterns. Painted finishes are also in the range of finishes. This are special acoustic panels which not only absorb the noise but also add design flair to classrooms, dining rooms and corridors. Individual panels can be grouped together to form beautiful patterns to suit your own ideal requirements. They are simply glue bonded to wall and ceiling surfaces. The give a focus point for children as they look visually attractive and their many colour options give life to a room. Fotosorba acoustic panels do two jobs in one product. 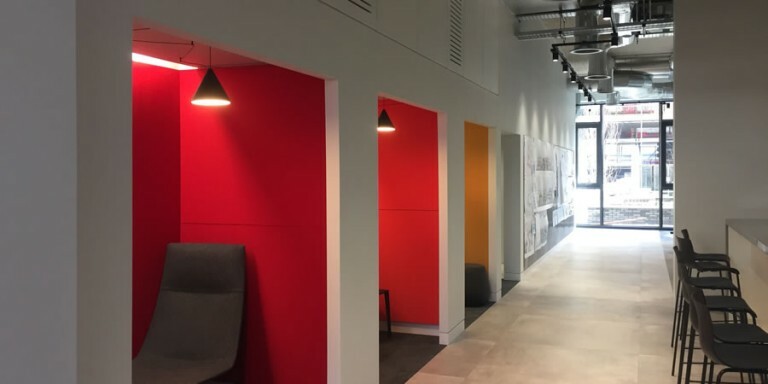 They not only reduce the noise levels but also decorate the room by the ability of digitally printed images on the face of these acoustic panels. You can have images from our stock library which has tens of thousands of images or you can send us your own image which we can print on the acoustic panel. The higher the resolution of the image which you send then the higher the quality of the printed image on the acoustic panel. 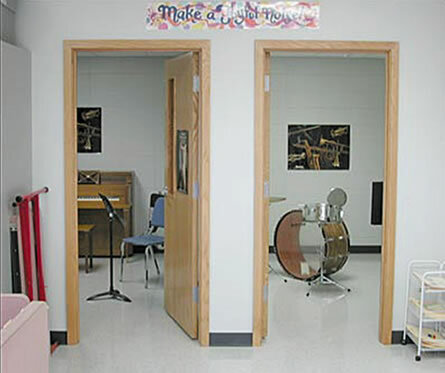 These are high performance sound reducing doors which are used in noise sensitive rooms such as music practice rooms, private offices, etc.. They are come is a variety of different wood veneer finishes as well as painted finishes. 44 decibels sound rated are available in single door leaf and 41 decibels in double leaf doorsets. Custom sizes can be manufactured also. Soundsorba offer a free acoustic advice service including assessing the acoustics in your school, Academy, College or University . The core of the panel meets BS 476: Part 6: Class 0 and the facing of the panel meets the requirements of BS 5867: Part 2: 1980 Type B performance. Bubblesorba sound absorbent panels are available in 10 standard colours. (More colours available on request). We have a range of standard pattern groups for you to choose from. Feel free to compose your own group of patterns and shapes to fit your interior at your workspace or home.